Starting with 108 anglers and now we’re down to 12. 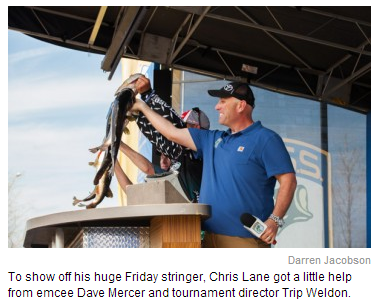 * Former Bassmaster Classic Winners….These anglers don’t just happen to get there on luck. It’s perseverance & hard work. The other 6 remaining are no slouches either. 4th place Keith Combs has 8 top 10 finishes and 1 win. 7th place Justin Lucas came from the FLW & has fished 10 tournaments with 8 of those cashing a check of which 5 were top 10 finishes. 9th place angler Kermit The Frog throwing Dean Rojas has 4 wins & 34 top 10. Is this his money maker Sunday? 10th place angler with 12 Classic appearances, 34 top 10, & 4 wins, Todd Faircloth may be 21 lbs behind the leader, but don’t count him out. Jason Williamson, sitting in 11th place, has 13 top 10 finishes of which 4 are 2nd place & 2 wins. David Walker may be sitting in 12th place but just remember how many pounds the leader weighed in on day 2. Walker could have the same results or better. And todays Big Bass was landed by Scott Rook….9-14 aint to shabby….Rook finished in 19th place. The weather is changing and a front is approaching. Will this trigger the bite? Can the sight fishing continue? Watch the results of day 4 on Bassmaster.com at 4 PM Sunday.